Download "SUBCHAPTER 57D APPRAISAL MANAGEMENT COMPANIES SECTION.0100 APPLICATION FOR APPRAISAL MANAGEMENT REGISTRATION"
4 21 NCAC 57D.0305 APPRAISER COMPETENCY Before an appraiser is added to a panel, an appraisal management company shall require the appraiser to declare in writing the appraiser's areas of geographic competency, the types of properties the appraiser is competent to appraise, and the methodologies the appraiser is competent to perform. The appraisal management company shall require the appraiser to update this information at least annually, and shall keep copies of all such declarations for a period of five years from the date they are submitted. Authority G.S. 93E-2-3; 93E-2-4(b); 21 NCAC 57D.0306 APPRAISAL REVIEW An appraisal management company shall review the work of all independent appraisers that are performing real estate appraisal services for the appraisal management company to validate that the real estate appraisal services are being conducted in accordance with USPAP. An appraisal management company is not required to review all appraisals performed by each appraiser, but may chose a representative sample of each appraiser's reports. An appraisal management company must review each appraiser's work at least once a year, and shall keep records of such reviews for a period of five years from the date they are done. Authority G.S. 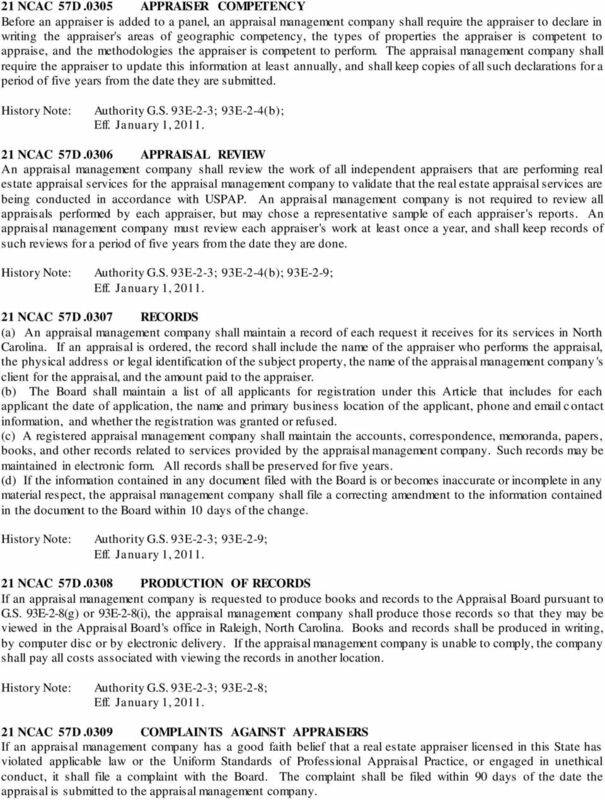 93E-2-3; 93E-2-4(b); 93E-2-9; 21 NCAC 57D.0307 RECORDS (a) An appraisal management company shall maintain a record of each request it receives for its services in North Carolina. If an appraisal is ordered, the record shall include the name of the appraiser who performs the appraisal, the physical address or legal identification of the subject property, the name of the appraisal management company 's client for the appraisal, and the amount paid to the appraiser. 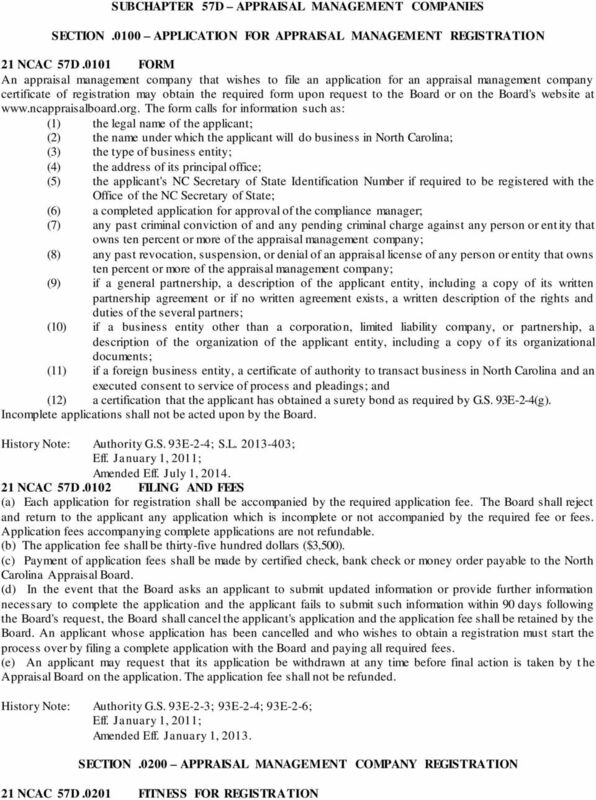 (b) The Board shall maintain a list of all applicants for registration under this Article that includes for each applicant the date of application, the name and primary business location of the applicant, phone and c ontact information, and whether the registration was granted or refused. (c) A registered appraisal management company shall maintain the accounts, correspondence, memoranda, papers, books, and other records related to services provided by the appraisal management company. Such records may be maintained in electronic form. All records shall be preserved for five years. 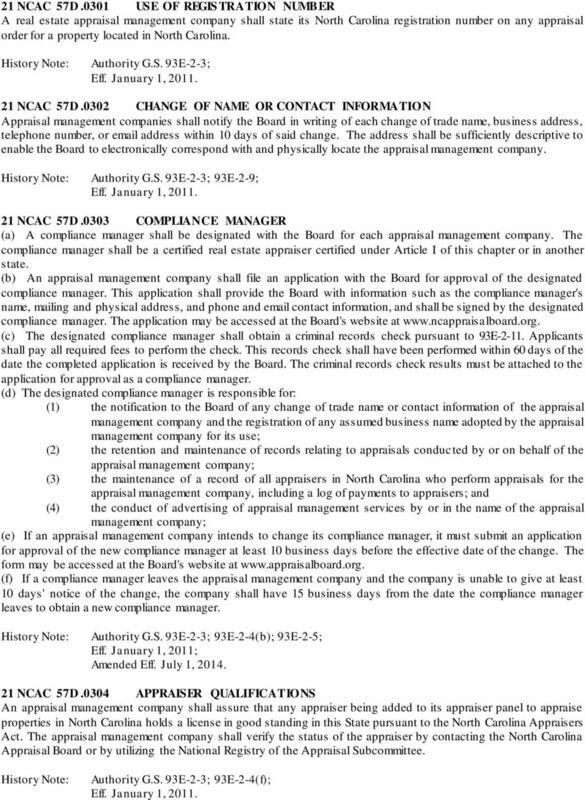 (d) If the information contained in any document filed with the Board is or becomes inaccurate or incomplete in any material respect, the appraisal management company shall file a correcting amendment to the information contained in the document to the Board within 10 days of the change. Authority G.S. 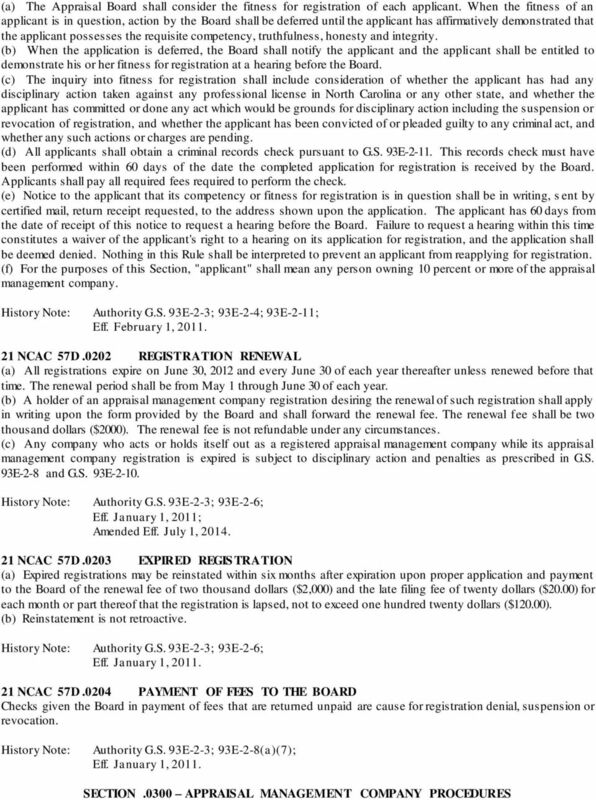 93E-2-3; 93E-2-9; 21 NCAC 57D.0308 PRODUCTION OF RECORDS If an appraisal management company is requested to produce books and records to the Appraisal Board pursuant to G.S. 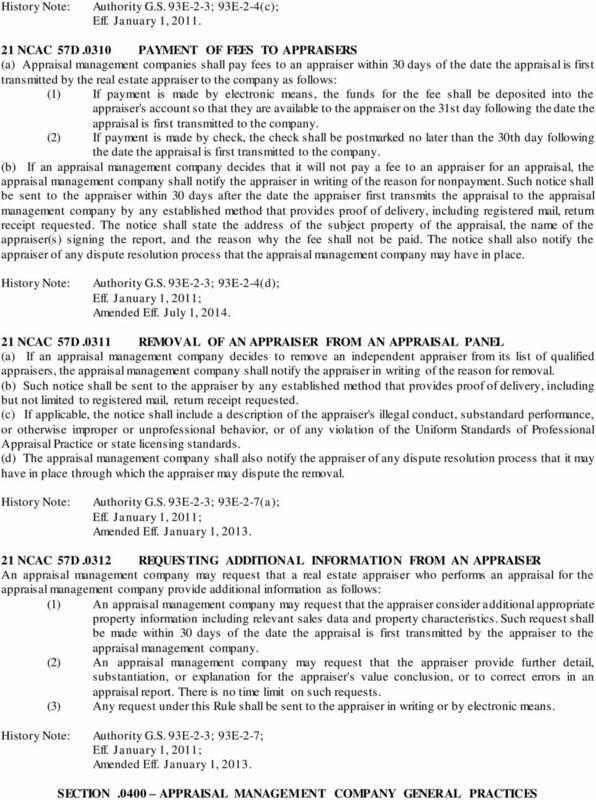 93E-2-8(g) or 93E-2-8(i), the appraisal management company shall produce those records so that they may be viewed in the Appraisal Board's office in Raleigh, North Carolina. Books and records shall be produced in writing, by computer disc or by electronic delivery. If the appraisal management company is unable to comply, the company shall pay all costs associated with viewing the records in another location. Authority G.S. 93E-2-3; 93E-2-8; 21 NCAC 57D.0309 COMPLAINTS AGAINST APPRAISERS If an appraisal management company has a good faith belief that a real estate appraiser licensed in this State has violated applicable law or the Uniform Standards of Professional Appraisal Practice, or engaged in unethical conduct, it shall file a complaint with the Board. The complaint shall be filed within 90 days of the date the appraisal is submitted to the appraisal management company. TITLE 365. CHAPTER 25. LICENSURE OF AGENTS, BAIL BONDSMEN, COMPANIES, PREPAID FUNERAL BENEFITS, AND VIATICAL SETTLEMENTS PROVIDERS AND BROKERS SUBCHAPTER 11. VIATICAL SETTLEMENTS REGULATION 365:25-11-1. TABLE OF CONTENTS Section 1. Authority. 30-1 Section 2. Purpose. 30-1 Section 3. Applicability. 30-1 Section 4. Promulgation, Amendment or Repeal of Rules. 30-1 Section 5. Definitions. 30-1 Section 6. Agency Determination [150B- 21.3A(c)(1)a] Necessary without substantive public interest. public interest. public interest. OREGON DEPARTMENT OF JUSTICE RAFFLE GAMING LICENSE APPLICATION IMPORTANT NOTICE READ CAREFULLY Raffle Games possess inherent risks for gaming licensees. Not all raffle games are successful fundraisers. 114CSR83 TITLE 114 EMERGENCY RULE INSURANCE COMMISSIONER SERIES 83 DISCOUNT MEDICAL PLAN ORGANIZATIONS AND DISCOUNT PRESCRIPTION DRUG PLAN ORGANIZATIONS Section 114-83-1. General. 114-83-2. Licensing Requirements. SUBCHAPTER 34D - PRENEED FUNERAL CONTRACTS SECTION.0100 - GENERAL PROVISIONS 21 NCAC 34D.0101 APPROVAL OF CONTRACT FORMS All preneed funeral contracts shall be transacted on forms prescribed by the Board.